Don't worry! It's not one of those evil flash jokes that scare the bejeezes outta you. It doesn't move or anything. It's just a plain old picture. I swear on my grandpa's grave that nothing will jump out at you. FYI: According to Martin Leal of Alamo City Paranormal, about 60% of the Alamo is the original structure. Here's a statue (cenotaph) dedicated to the Alamo heroes. The figure on the front represents the ghost (yes, ghost) that saved the Alamo from being destroyed. The west and east sides of the cenotaph depicts some of the men killed during the battle. This is the first statue that actually depicts or represents a ghost. Interesting. I must have missed that the last time I was there. Thanks for posting that! My husband and I live just outside of San Antonio and we go to the Alamo all the time. I have never experienced anything paranormal in the church but the long barracks have always given me the willies. I have felt something like a peaceful reverance and faint sadness in the church and on the grounds, but as I said before the long barracks have a strange feeling to me. I have taken many pics but have never gotten anything in them. Maybe I will go back and look them over again. If anyone gets the chance to visit SA, I highly recommend visiting the other missions here. The Alamo is the northernmost mission in SA. They are dripping with history and some of them are very beautiful. A few are even still in use today. Originally from San Antonio, I too have been to the Alamo a few times. The barracks do hold a bit of eeriness in them. As for the ghost that saved it, If I remember the story correctly, after the battle, Santa Ana sent his troops in to level the place. As they were getting ready to blow it up they saw red glowing eyes coming towards them. (Can't remember how many, but some think it was the fallen heros.) And then the spirit. They ran back to tell Santa Ana, and the idea of demolishing it was dropped. It is also interesting to note that there have been quite a few changes and restorations to the Alamo throughout history and each one has been met with ghostly activity and strange occurences. As for the actual building that is also true that it stood in the center. The area around it is know now as Alamo Plaza, that whole area is know to be haunted. That's what the story was. Six spirits came floating out of the door toward Santa Ana's men. If you stand in the Alamo Plaza, you're actually standing in the oldest cemetery in San Antonio until it was paved over. i wonder if there's anything in the basement? sorry, i couldn't resist. I think I actually do remember my brother telling me there was something down there. Dont remember exactly, I will have to ask him as this is one of his favorite hauntings. Interesting note. My brother one night was doing security work at one of the smaller hotels in the area, and was told by the guy he relieve that it was haunted. The guy said it was thought that the ghost was from that time, but no one was too sure. After the guy left, my brother asked the ghost who they were. He heard the name Bowie. (Jim Bowie was one of the heros of the Alamo.) My brother went about his business for the night. In the morning, when the new guy came to relieve him, my brother was walking out and said, "Good bye, Mr Bowie. It was a pleasure. He says he felt a hit on the back that was so hard it pushed him forward spilling his coffee. I guess the ghost was trying to give him a pat on the back to say good bye. I found out that the basement doesn't exist anymore. But I think it was in the area where the gift shop is located now. Last I heard it did exsist, but it was mostly offices now. i think everyone missed my joke... the proper response would have been to laugh uproariously and say "there's no basement in the alamo!" sorry, i watch peewee's big adventure WAAAYYY too much. OMG! How did I manage to miss that? Thanks, pyrophile! I needed a good laugh. Sorry I did miss that. But there IS a basement. They use it for offices or somewhat. I remember when I went on my honeymoon we stayed at the Emily Morgan, which is right next door. Fed Ex or UPS came to make a delivery to the Alamo. They were on the side walk by the Alamo and pushed some thing. A hole opened and there was a platform. The guy rode down it. Sounds sci-fi I know, but true. It looked like the lift in Blast from the Past or Sean of the Dead (for those who have seen either. ) A few moments later the guy came up and closed it. Got in his truck and left. So see there is one. I don't think they allow cameras on the inside anymore something about people selling the pics I beileve. I heard about Oz taking a whiz on the Alamo and being banned from there, but I never heard about the 666 thing. Looking at the pic, I can see the 1st and 3rd 6's...but I don't see the 2nd one at all. 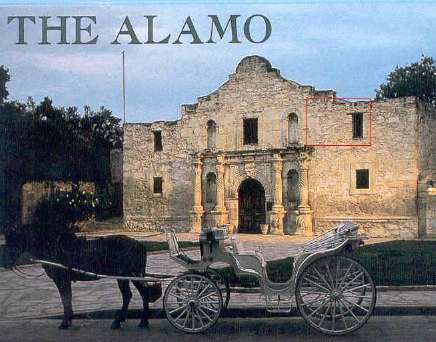 Does anyone have any pics of their own of the Alamo? Just bumping this topic, instead of creating a new one. The Alamo was one of the spots I visited on my recent holiday and it was overrun by tourists in the middle of the day (as you'd expect!) it certainly felt solemn, but I can't say that I experienced anything that could be attributed to paranormal events, perhaps going through the day wasn't the most opportune time? Any members have stories to share from this location? Hey, y'all! Just got back from San Antonio on Saturday. I went on a ghost hunt (with my mom style_emoticons/default/dry.gif ) hosted by Alamo City Paranormal. We actually got something! We got a cold spot in the area where the man in the black duster and cowboy hat has appeared. The temperature dropped from 57 to 34! It's partially correct. Ozzy peed on the Cenotaph monument. Also, I only see one area that there appears to be a six made from the mortar.